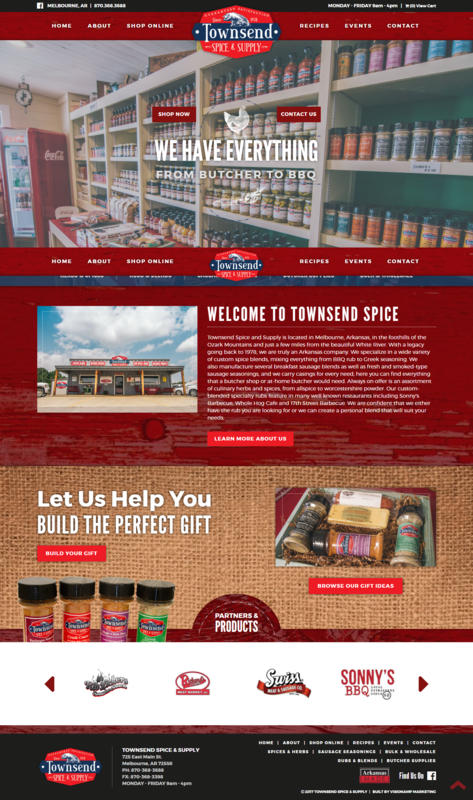 We “spiced” up the Townsend Spice and Supply website design by adding a user friendly navigation and services menu while still incorporating the brand’s rich color scheme. This is an e-commerce site with many size variations and options, so the client wanted the cart design to be easy to read and use on the front end and the back end. Townsend Spice and Supply is located in Melbourne, Arkansas. They specialize in a wide variety of custom spice blends, mixing everything from BBQ rub to Greek seasoning. They also manufacture several breakfast sausage blends as well as fresh and smoked-type sausage seasonings, and carry casings for every butcher's need.